Today we are flying from Heathrow to Berlin. It’s our first experience of the ‘improved’ British Airways service, which offers paid drinks and snacks. Thankfully, it’s only a short flight, as the stories I’ve heard about poor service just keep adding to my growing disenchantment with this airline. It seems not a week passes without a British Airways horror story making the headlines. Today, we will see for ourselves, whether the British Airways short-haul economy service is as bad as it has been made out to be. I have no issue paying for drinks and sandwiches on flights which cost a pittance. However, the cheapest I’ve ever paid for two British Airways flights is £70, and that is because they were reward flights. Frankly, I find British Airways flights overpriced compared to the competition, so I struggle to comprehend how the airline can justify these flight prices, and charge you for in-flight snacks and drinks! Begrudgingly, I have to confess, the menu is reasonably priced. Crisps start from £1 and sandwiches from £3. 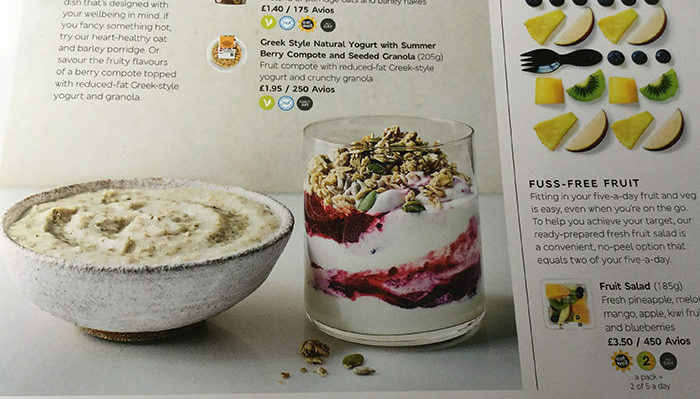 Y0u can even grab this lush looking yoghurt and fruit concoction for £1.95. The sandwiches do look pretty appetising and probably don’t cost much more than if they were bought in M&S. You can take your pick from an inspired choice, including harissa chicken and couscous salad. Just check out the full menu here. At first, I think the service seems pretty efficient, with staff patrolling the economy class cabin taking orders on IPADs. I mistakenly believe these are food orders, and think it a great improvement on the usual cart blocking the aisle. It turns out this is actually in-flight duty-free sales. Bizarrely, shop sales take priority over food and drink sales, which may explain the complaints about passengers not being served drinks at all. If you get thirsty on flights, you may wish to bring some water onboard, as you might pass out from dehydration before they get to you! Maybe this is deliberate as I don’t see many people purchasing. It is clear the message about paid service has filtered down as I also do not hear any complaints. 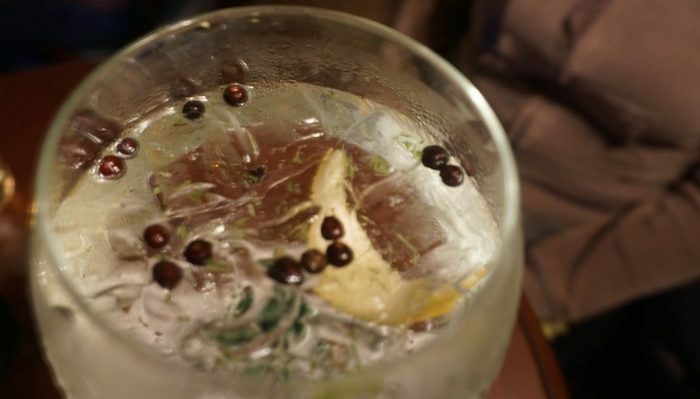 However, whilst paid service on EasyJet or Ryanair flights doesn’t seem to deter people from ordering a G&T, the same cannot be said of the British Airways paid service. Perhaps many others are taking the same view as me, and refusing to pay extra for drinks and food after paying for a premium ticket. If you are looking for a way to burn through any spare AVIOS, you can use your AVIOS to pay. Take note, British Airways do not accept CASH, so if you don’t come prepared, you will have to do without. I guess my verdict is that forewarned is forearmed. The service is certainly not as expensive as it could be, but a couple jetting off for a weekend, are still going to pay around £40 extra. That assumes they each enjoy just one glass of wine and a sandwich. It just begs the question, what will they charge for next? Have you experienced the new, enhanced service and if so, what did you think? Also, have you heard the rumour that this service might be extended to long-haul? Good article Anne, thanks for sharing. It seems to be a sign of the times, especially with some of the other flag carriers acting like Low Cost Carriers. BA was never one of my first choices to fly – even from the UK – and less so given some of the brutal cuts in recent years. That said, given recent IT issues, their service recovery of offering good elite status shows they are conscious of churn away from BA. Crikey, even Emirates are bringing in some cheeky charges these days and whilst I always prefer to #alwaysturnleft, some of the LCCs I’ve tried lately have been better than expected. I guess it comes down to the old adage about managing expectations in the main? Hmm this all comes down to price vs value for me. On Ryanair/Easyjet etc the tickets usually cost peanuts so I don’t care if it is no frills or not. However, if I am paying significantly more (eg a premium fare ticket) I would expect them to include something. Perhaps that could be part of the inclusions for a premium ticket – although as you say it still is included for business/first class. I imagine they’d be uproar if you’d have to pay £6 for prosecco in first class! Yes I definitely would be unimpressed, after all the price of your first class ticket is more than enough to cover the cost of a bathtub full of the stuff! This is indeed an honest and frank review. Though I have not flown British Airways, I find this is the same scenarion in many of the airlines which have paid services. It is more a case of hawking their wares mid-air rather than providing service. I have quite a bit of avios points and have never flown with British Airways and have ended up using my points to fly with one of their partners. I had no idea that you had to pay for any type of drink on their aircraft. That’s really good to know because I tend to rely heavily on air crafts to provide water. It’s only in short haul economy. They haven’t yet introduced this on long haul services and obviously business and first still get food. I have never flown with British Airways yet, and I truly love how honest you’re in giving your review regarding this plane. Anyway, I find it good, but sounds expensive for me. I like the service, the comfort that they offer while flying, but charging much is no good. I hope that they won’t be charging enough for the passenger cause we all look for a cheaper air ticket whenever we fly. I certainly think that soon they will start charging for toilet. Haha! 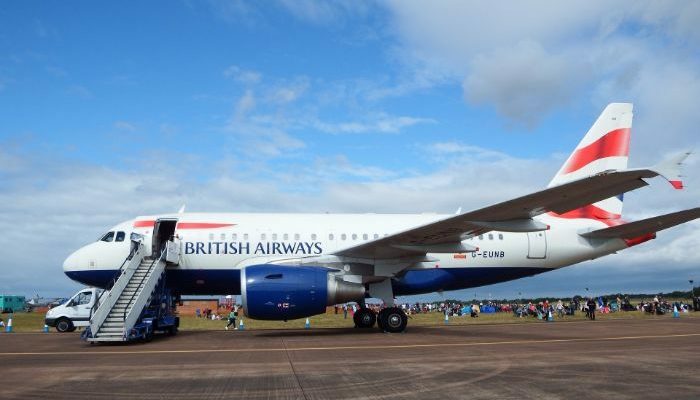 I have never used British Airways myself so I can’t speak for it, but glad that I got to know about their services! I’m surprised as I had good assumptions about them. Yes that did not go down so well with the public when Ryanair started suggesting they would charge for toilet use. I dread to think! Ha Ha! Bugger all service! That is right. You get more on Ryanair now! I couldnt believe what they were doing to the catering, all there food is from M&S and they stripped first/business class catering down to a tee. I always found their customer service stinks and never on time. As a British traveler, I vowed to never travel with them again. I rather fly Ryanair to NYC or Melbourne than them!